The Wine Appreciation Evening at Tawa Club was enjoyed for its difference and the ability to socialise with members of Tawa and Johnsonville clubs. Our wine skills were tested and several members of Plimmerton were on The Plonkers Table who correctly named all six wines which were blind tasted. I think we all learnt something more about wines but the area in which the grapes are grown has a huge effect on the resultant wine. The Pinot Gris from Ohau was very like a Hawkes Bay Chardonnay!! The evening was run by wine consultant, Chris Morgan, from Ohau Wines and three of his wines were featured. Order forms were distributed. Well done Wendy on presenting a very full submission for the prestige of receiving this Award. Fred joined the Rotary Club of Porirua on 14 May 1990. Fred’s involvement in Rotary came after their son, Karl Denz, was awarded a Rotary Twin Matched Student Exchange to the Rotary Club of Blacktown, Sydney, in 1987. Fred was for many years, and on several occasions, the Club Treasurer and was also Treasurer of the Club’s Charitable Trust. He was involved in many ways with the Club’s youth activities including with Glynis being host parents for many Rotary Exchange Students hosted by the Club. He was Porirua Club President in 1998/99. Fred introduced his wife Glynis to Rotary. She was a charter member of the Rotary Club of Kapi Mana and its President in 2001/02; and later after the merger with Porirua Club was the President of Porirua Sundown in 2006/06. Fred was awarded a Paul Harris Fellowship in 2000/01. 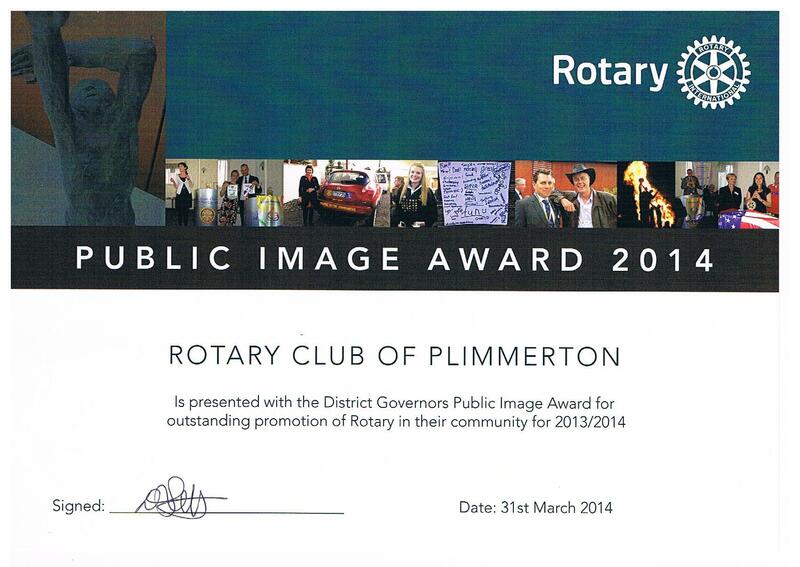 He was also awarded a District Governor’s Citation for his work as attendance secretary in 2010/11 and 2011/12. Fred was for many years a supporter and team captain of the Club’s Cancer Relay for Life team. Fred sadly passed away suddenly while on holiday in Taupo on 30 March 2014. A celebration of Fred’s life will be held at 11:00am on Monday 7 April at the Te Rauparaha Arena, Porirua. Our condolences go to Glynis and her family at this sad time. Glynis has invited Plimmerton Club members and their partners to be part of a Rotary Guard of Honour at Fred's Celebration of Life at the Te Rauparaha Arena on Monday 7th April at 11.00am, when he will be brought into the arena. Also members with PHFs please wear your medallions. Mock Interviews will be held at Aotea College on Friday 11 April, from 8.30am to 3pm. Philip Whearty is looking for members to assist in this very worthwhile activity. Phone 027 448 9094. The Opening of the first section of Te Ara Piko will be held on 27 and 28 May 2014. Acknowledgment is made for the tremendous help of PD workers at the Book Fair, with thanks to Richard Sherwin for his facilitation. The speaker at the next meeting on 8 April is Guy Ockenden from Riding for the Disabled. Original generation time 1.4434 seconds. Cache Loaded in: 0.0415 seconds.